Guards against moisture in carpets, bedding, sails and lockers. Helps prevent condensation on windows and ceiling. Keeps mold and mildew from forming during storage and lay-ups. Protect papers and containers that may be susceptible to moisture damage. Prevents swelling and sticking of doors and drawers. Control musty odors in basements year around. Prevents moisture from forming on clothes, sheets and shoes. Keeps blankets from becoming "musty". 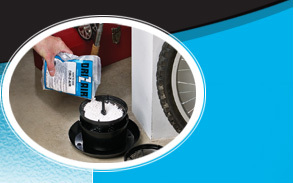 Removes moisture from the interior of trailers and campers during periods of storage or lay-up. Protect furniture, bedding and clothing from moisture. Use in closets to prevent musty odor. Use in bathrooms to control excess humidity. Protect bicycles, yard equipment and sporting goods from moisture damage.